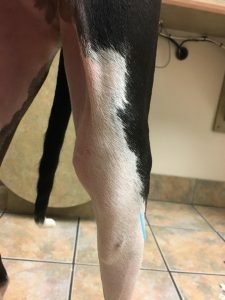 Zokie, a 4 year old female spayed Great Dane, presented for reexamination after diagnosis and treatment for iliopsoas pain 2 years prior. Physical and myofascial exam revealed abnormalities associated with the stifles, lumbosacral area, and caudal thoracic region. Acupuncture points Governor Vessel (GV)20, GV14, Stomach (ST)34, ST36, Spleen (SP)9, SP10, Bladder (BL)13, BL14, BL15, BL27, BL54, Gallbladder (GB29), GB30, and Bai hui were used in three sessions. Improved comfort and mobility were benefits noted by the owner along with new jumping behavior not seen prior. Zokie, a 4 year old female spayed Great Dane, presented for reexamination after acupuncture treatment 2 years prior. Zokie originally presented to a University with lameness and was evaluated for orthopedic causes and was diagnosed with iliopsoas pain. There she underwent 5 treatments of acupuncture with laser therapy and electroacupuncture. Zokie has received glucosamine chondroitin supplementation and was placed on a large breed diet since treatment. The owner also stretches and massages the lumbar and iliopsoas muscles a few times a week. No signs of lameness or discomfort has been noted since the previous acupuncture treatment. It was noted that Zokie will not jump into the car. Physical examination revealed significant medial buttress bilaterally with crepitus bilateral. Lateral boney thickening was also noted on both stifles. Mild muscle atrophy of the quadriceps and gluteal muscles was noted. No abnormalities were noted on neurologic examination. No cranial drawer or tibial thrust was elicited on orthopedic examination. GV14, GV20 and Bai hui were used to help Zokie relax for acupuncture therapy through parasympathetic and autonomic modulation. BL13, BL14, BL15, GV 14, and trigger points were used to address the tight band of the longissimus musculature palpated on exam and thoracic compensatory pain through local stimulation. ST34, ST36, SP9 and S10 were used to address discomfort with the stifles through local stimulation. BL27, BL54 GB29, GB30, and Bai hui were used to address discomfort with the hips or lumbosacral area leading to muscle loss through local stimulation and as distal points for the stifle pain. All points were stimulate via dry needling having local effects on connective tissue and nerves. This in turn provided analgesia locally and distally through neuromodulation. The severe medial buttress indicated bilateral stifle instability even without cranial drawer or tibial thrust elicited. 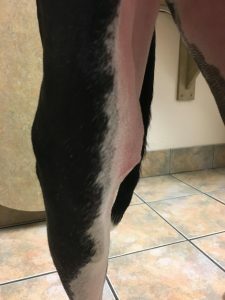 While neoplasia and fungal disease was not ruled out at this time, bilateral presence without clinically appreciated lameness placed these differentials lower. The decreased muscle mass of the quadriceps and gluteals suggested hip or lumbosacral pain both of which could be compensatory pain from the stifle pain. Tight bands palpated in the longissimus musculature likely compensatory pain secondary to the hindlimb changes. Stifle pain, hip pain, or lumbosacral pain would account for the historical absence of jumping behavior to high surfaces. Acupuncture has been noted in several studies to have beneficial analgesic effects for musculoskeletal disorders. Although it has been difficult to create quality placebo control or double blind studies due to the multitude of variable present with acupuncture, beneficial results have been noted for a multitude of disorders. In one study of lameness acupuncture was compared to cage rest with increased mobility noted 6 days after one treatment and benefits continuing 8 day after the second treatment2. In another study that compared acupuncture to carprofen for hip dysplasia noted only acupuncture decrease pain at week 4. In the same study acupuncture alleviated signs for 2 weeks post treatment as well. It was also noted that rescue analgesia was not needed for the acupuncture group but was needed for the carprofen group3. It has been suggested that acupuncture alleviates pain through stimulation of blood vessels, nerves, and connective tissue. This stimulation causes the release of various neuropeptides, cytokines, and neurotransmitters that modulate both acute and chronic pain. Tigger points can also be addressed with direct needling to alleviate the regional pain1. Similar results were noted in this clinical case. No specific gait analysis methods were used for this assessment beyond client observation. The owner described an increase in energy, excitement, and running behavior post treatment. Post first treatment jumping into the car was noted and continued throughout therapy. As no additional therapy were introduced during this treatment period, changes can be suggested to be a result of the acupuncture therapy. While this case had little for clinical signs, benefits were noted post acupuncture treatment. Many patients may benefit from acupuncture treatment if musculoskeletal abnormalities are noted on physical exam, even if clinical signs are not present. 1. Fry L, Neary S, Sharrock J, Rychel J. Acupuncture for analgesia in veterinary medicine. Topics in companion animal medicine. 2014;29: 35-42. 2. Lane D, Hill S. Effectiveness of combined acupuncture and manual therapy relative to no treatment for canine musculoskeletal pain. Canadian Veterinary Journal. 2016;57: 407-414. 3. Teixeira L, Luna S, Matsubara L, et al. Owner assessment of chronic pain intensity and results of gait analysis of dogs with hip dysplasia treated with acupuncture. Journal of the American Veterinary Medical Association.2016; 246: 1031-1039.